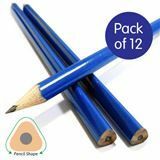 Pack of 12 Blue Triangular Pencils - Easy grip - They do not roll off the table. 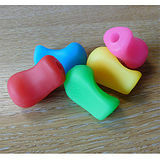 Some pupils find triangular pencils easier to grip. 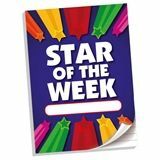 The 3 wide sides and rounded corners help children to position their fingers correctly and comfortably, giving them confidence when learning to write. Each pencil has a blue wooden barrel with graphite lead and marked with our company name.